Contact & Reservations – We reply to all reservation requests within 24 hours if you do not hear from us please give us a call. Fat Olives is a great place to have a small informal celebration, situated only 25 yards from the quay it provides a wonderful picturesque backdrop of Emsworth’s Harbour – a perfect place for photographs. If, you wish for a relaxed and intimate occasion for Christmas, a Birthday or Wedding Celebration of approximately 20 to 24 people then you can book Fat Olives for your private use. Based on a minimum number of 20 guests for Lunch Tuesday to Saturday inclusive or for 24 people for dinner available Tuesday to Friday inclusive. Alternatively for your comfort the maximum number of guests we are able to accommodate on one table is eight for lunch and dinner reservations. 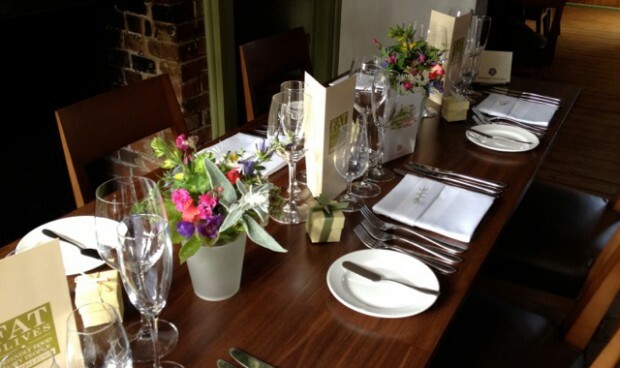 Menus are arranged with Lawrence and are tailored to your own personal preferences. Menus are either a three course set menu or a choice menu pre-ordered in advance. Our current set dinner menu price is £36.95 and £21.50 for lunch inclusive of fresh vegetables or potatoes with your main course and coffee. A 10% service charge is added to the final bill. Please call us on 01243 377914 or email info@fatolives.co.uk to discuss your celebrations or if you require any further information. Reservations can be confirmed by forwarding a non-refundable deposit of £5.00 per person for Lunch bookings and £10.00 per person for Dinner. Some of the photographs on this website are courtesy of Fiona and Nick who celebrated their Wedding Reception here at Fat Olives in April 2012 and their photographer Kate Cooper.